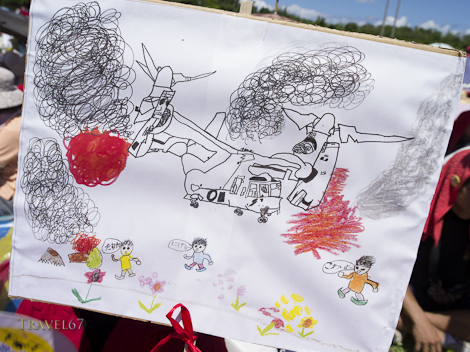 These are a few images from a local protest against the arrival of Osprey helicopters. US Marine Corps MV-22 Osprey helicopters are now based at Marine Corps Air Station Futenma in central Okinawa. 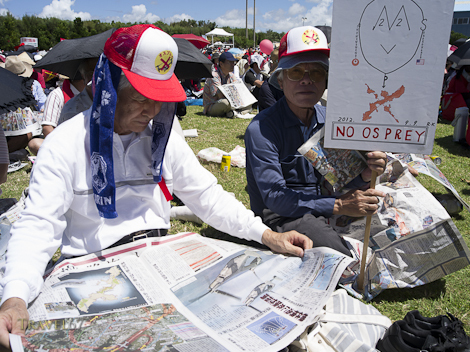 Locals were protesting against the poor safety record of the Osprey and the close location of Futenma to residential areas. It was one of the hottest days of the summer and the protest took place just after noon. I was actually surprised I didn’t hear of anyone suffering from heatstroke or worse. Reports from the organizers put the crowd at 100,000 people. 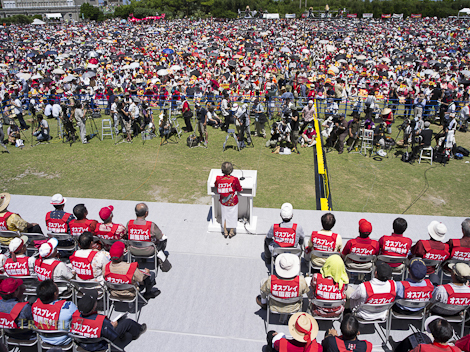 To me this was far too high ( the number of protesters seemed smaller than the audience in front of the green stage at Fuji Rock which was about 25,000) but it was still an impressive turnout. 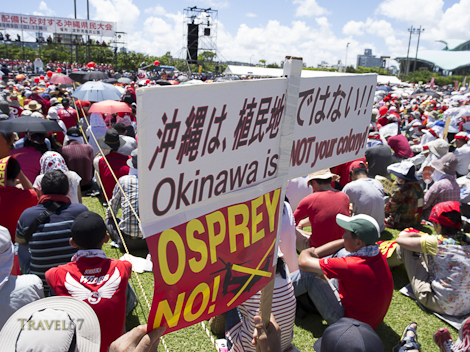 The Okinawan people didn’t get their wish to keep the Osprey’s out of Okinawa. The helicopters will be based here so that the US military have the latest technology to train with, but it’s a bit of a gamble for the US and Japanese government. If there is an incident involving the Osprey helicopters after so many protests, the backlash from locals will be huge. 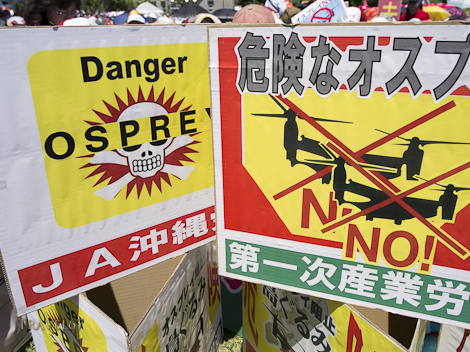 In some ways the protests over the arrival of the Osprey seemed to distract from the larger picture of Futenma base still existing at all. It’s a bit like being angry that the guy who keeps blocking your driveway with his car has just switched from a Ford to a Chevrolet. Previous PostBack on line eventually.